Art of the Carolinas, an international exposition of artist materials and techniques for artists, instructors, students and hobbyists, puts Raleigh, NC on the map every November as it graces the art community with workshops, discounts and product demonstrations. 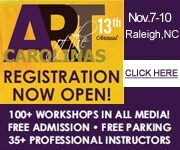 Art of the Carolinas is an event you can not afford to miss! This year marks the 13th annual Art of the Carolinas Art Materials and Exhibition Trade Show once again in Raleigh North Carolina. Art of the Carolinas, an international exposition of artist materials and techniques for artists, instructors, students and hobbyists, puts Raleigh, NC on the map every November as it graces the art community with workshops, discounts and product demonstrations. Jerry’s Artarama, Raleigh’s premiere art supplier, will host the annual event Friday, Saturday and Sunday, November 8, 2013—November 10, 2013 at the Hilton North Raleigh (3415 Wake Forest Road). Workshops begin on Thursday, November 7, 2013 and run through Sunday, November 10, 2013. Art of The Carolinas features over 35 Professional Art Instructors and 100+ workshops ranging from acrylic painting, oil painting, drawing, mixed media, journaling, watercolors and so much more. Art professionals fly in from all over the country to offer you the latest instruction in your choice of art and application. On the other side of the hotel in the Grand Ballroom and Prefunction area, is the trade show itself. Major art supply vendors set up booths with all kinds of fantastic art supplies for attendees to see, try and ask questions about. Bargain prices are everywhere. In addition to all the workshops, there are free demonstrations and the ability to speak directly with the manufacturers and artists about any questions, tips and techniques concerning their products. Since Art of the Carolinas’ inception in 2001, director Sharon DiGiulio has created an oasis for artists, featuring a kaleidoscope of workshops, world-renowned instructors, vendor booths, wholesale prices and product demonstrations. This year will be no exception. DiGiulio anticipates the trade show will once again attract thousands of artists from hobbyists to professionals nationwide. Art of the Carolinas welcomes artists of all levels and offers free admission and free parking, plus free demonstrations. Registration has been open since June and would be event goers have visited the website to book their workshops and trip early. Jerry’s Artarama was founded in 1968 when Jerry Goldstein opened his own art supplies and materials store in Long Island, N.Y., introducing discount pricing to budding and established artists. Jerry believed in treating customers like family, a tradition that still continues. Today, Jerry’s offers over 70,000 top quality art materials at direct savings—as much as 75 percent off traditional retail on products from the industry’s top art manufacturers, as well as Jerry’s own exclusive product lines via an online retail store, art supply catalog and Jerry’s Artarama Superstores. In addition, Jerry’s Artarama serves as an artist resource by providing instructional workshops; new art supply demos; and special art-related events, including the Art of the Carolinas Tradeshow, an annual event held in Raleigh, N.C., Jerry’s Artarama corporate headquarters. For additional information, please visit http://www.jerrysartarama.com.